A lifelong love of Thai food and a chance meeting with one of Thailand’s most celebrated cookery teachers resulted in me publishing a book of my famous mentor’s recipes and that has led to me doing so many other things… Cooking for supper clubs…arranging pop up events …. co-editing Wing Yip magazine…taking chefs on food tours … article writing and even making and selling spice mixes. Mae’s Ancient Thai Food is my tribute to Gobgaew Najpinij and is a tribute to our shared passion for unlocking the secrets behind traditional Thai cooking. The book is intended to take foodies on a cultural culinary journey through a collection of Gobgaew’s traditional recipes passed on in this book as a legacy to her Thai heritage. When I met Gobgaew fourteen years ago during a Thai cooking course in Bangkok, I was so fascinated by her knowledge that I flew back to the country within a week of returning to the UK, determined to learn more. There was something so magical about Gobgaew’s enthusiasm and skill that I couldn’t wait to get back to Bangkok and work with her. I had fallen in love with Thai food after visiting a London restaurant in the 80’s and thinking wow, this is amazing. I knew the only way I would ever be able to cook in the same way, would be to go to Thailand and learn from those who had perfected the art of developing traditional recipes. Gobgaew had recognised my passion on the course in Thailand, I was learning more and and she was helping with the organisation, after that tour she asked me to return to Bangkok to become one of her students. I have to say that this was not a commercial arrangement it was something that evolved from a friendship. Every day for four months, we would go to the markets together to buy ingredients. Everyone knew her. She was bossy, funny and had a child-like quality which spilled over into a pure love of passing on the ancient Thai cooking culture she had cultivated over decades. That was then the first of many such trips. It was a life-changing and deeply privileged experience for me and even though, at the beginning, we could only communicate in broken English and Thai, we became so close that she told me to call her Mae which means ‘mother’ in Thai. Gobgaew, who was born in 1941 in the north eastern Thai province of Udon Thani, had, by then, established an international reputation as a chef, having taught at Bangkok’s Suan Dusit University. 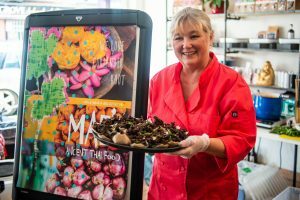 Following her retirement from her Assistant Professor post, she became a consultant, helping chefs at a host of famous restaurants including Washington’s Thai Amarin, Cool Basil in California and Banjarong in India. Even though Gobgaew had supported and passed on recipes to many published authors including Chef Robert Danhi, Chai Siriyan and the Australian chef and restauranteur David Thompson, she had never considered publishing her own book, despite co writing a book that is still used in educational establishments today. After a lifetime spent honing the skills that she had learned from an aunt who taught her to cook in the Royal Thai manner and presenting her recipes to chefs from international Royal households, Gobgaew thought the time was right. I began to select Gobgaew’s favourite Thai dishes, cook them and photograph them and often Ning (her daughter) helped with checking and testing. At the same time I would take photographs of the capital’s colourful, bustling kitchens and street-life to accompany the recipes. I also enlisted the talents of fashion designer Michele Bastock, whose two tone dress for Roman Originals (some saw it as gold and white and some saw it as black and blue) sparked a global debate on Twitter, to add her own graphic design flair to the book. The resultant Mae’s Ancient Thai Food has since become 2nd best seller on The Cooks List and is an exciting collections of Thai recipes which sells mainly to chefs. Sadly, Gobgaew, who died at the age of 75 last year, never saw the published version of what became a decade-long labour of love but it remains a lasting legacy to those who knew and loved her. David Thompson also supported us by giving a tribute to Gobgaew on the back of the book. Bury Market - A Blast From the Past!